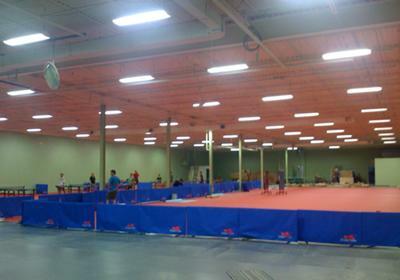 My Table Tennis Club Mississauga is a new center of excellence for Table Tennis in Ontario, Canada. 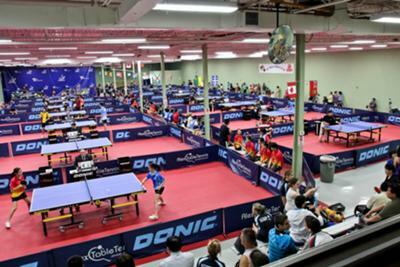 MyTTC Mississauga is unofficially the largest and the best club in North America with up to 40 tables available, which has successfully held and organized 2011 ITTF North America Championships / Cup in April 2011 and Canadian National Championships 2011 in July 2011. My Table Tennis Training School is also established inside MyTTC Mississauga to provide a breeding ground for a new wave of teenagers and adults who want to take table tennis as their leisure playing or are passionate in becoming professional players. No matter of what kind of expectation you come with, My Table Tennis Training School with decent and well-known coaches is right here to get you on the right track. My Table Tennis Training School can attain your goals effectively through systematic and scientific approach and of course, let you and your family have more enjoyable time playing table tennis. The club had its official grand opening on October 16th 2010 with a ribbon cutting ceremony and exhibition event with past World and Olympic Champions from various Chinese National teams. The players were: Lin Lv, Ju Li, Jun Gao, GuoZheng Liu and Ying Ying Zhang. Besides providing a professional venue for the Mississauga and surrounding area players, the club selected a large and independent building for the purpose of hosting major events national and international wise.